I am new to this...Hours ago I purged a couple of files ONLY and hours later it is still purging. Is this normal? Is there a way I can check exactly what it is purging while it is purging. Is there any way I can stop it? Something seems very wrong. HELP!! I am having the same problem. My on line back up has now been purging for almost 72 hours, and it's for just a couple of files. I'd hate to think how long it will take if I deleted my computer. What is somewhat troubling is the fact that you cannot MANAGE files that have been "backed up" unless you "Buy Now". I say, for those who have purchased N360, allow the additional features to be activated. By "additional features" I mean the "Remove a computer" and "purge" functions. For crying out loud, they give you the other features - - let them give you the ability to delete if you need to. Very sneaky if you ask me. For the average user, unknowingly, they could be "backing up" files thinking that, "Oh, if I need to delete them - - I can just do it later...." WRONG! For an additional $29.00 or so then you can. Maybe it's just me, but I think this is underhanded and BAD business practise on the part of Norton/Symantec. By the way, if I have something wrong here, feel free to issue an addendum, however, even though I am a N360 Premier Edition user and "trialed" NOBU, and supposedly "activated" it, I STILL CANNOT access the additional features. I am thinking that if I want the ability to delete, I will have to make another purchase. I think I even read where they explain that once you pay, you will be able to "manage". And, in the "help" file the ability to delete/purge/remove computer is under Norton Online Backup (NOBU) Management section. Ergo if you want to delete, you have to pay. Frankly, I think I have "paid" enough. Furthermore, I was just piecing this together from reading a snippet in one place (that I can't even remember where I saw it) on that webpage then comparing what they meant by "management" as it was defined in the annoying help file that took forever to load. Unless I have missed something so obvious, the fact that you cannot purge etc. unless you PAY additional (outside of what you paid for the N360 product) should be PROMINENTLY emphasised. Then I was caught in a vicious cycle. I was clicking the "Activate Now" radio button over and over etc. thinking that might be the problem - - all to no avail. I figured I "trialed" it, should not I have full access? I guess not. I guess you don't have to use the backup feature and I guess they are giving you the benefit of at least being able to access your files online should the need arise, however, what about the many people who started using the backup, now have to delete say because they are not sure if Norton/Symantec is taking reasonable measures to protect their files, and don't have the extra $29? Are they out in the proverbial cold (so to speak)? What Norton could do is open up all the features (for N360 users) and just charge extra if they want a significantly greater amount of online storage. I also have a problem getting rid of online backups for Norton 360. I have had severel support calls about this and it has now been escalated however I think my problem is that the backups are corrupted as the delete fails however you run it. There is no facility to purge for Norton 360 users usng the the web even if you activate Norton online backup you can only purged backups created wth it and not N360. I agee it would make sense to add this facility for N360. I've purchased the 25GB Norton Online Backup on top of the 2GB from Norton 360, believing that would make it possible for me to delete obsolete backups. But, like MartinB said, there's nothing I can do with my old data from the web based access. I am still running Norton 360 on my primary computer, but I've removed the license from my old laptop and want to delete its backups to recover my space. Very disappointed my purchase didn't solve the problem, I'm hoping this will not just be escalated for MartinB but resolved for everyone who was expecting to get better control over their cloud backup service. (I don't understand how a company as influential as Symantec can get something as important as purging obsoleted content from cloud backup wrong, when Dropbox is doing so well, on multiple platforms, without even charging most of its users.. It's my guess that the only way to remove obsolete backup sets (created with 360 rather than Online Backup) at present, is to delete them on the system itself -- this is surely no help to those of us who no longer have the obsolete set-up to purge that configuration/data from. Put any file in it. Create a new backup set. Delete your old backupset and files. I did that before, Zenwood, but it did not make it possible for me to remove sets created on other computers. It also did not remove the original "DefaultSet" on my main system from the Backup Online web interface, although I may be able to get that to work correctly if I re-enable Backup through 360 and try again. On the other hand, today, I discovered that I was able to delete them through the Norton Backup Drive interface in Windows Explorer. The files are gone and my space is recovered, but the sets still appear on the Backup Online web interface. That doesn't bother me so much, since the sets are actually fully emptied. If others attempt to do this, note that I also installed Norton Management before backup sets from other PC's showed up in the Norton Backup Drive. I don't know if it was supposed to be required, or just a coincidence. 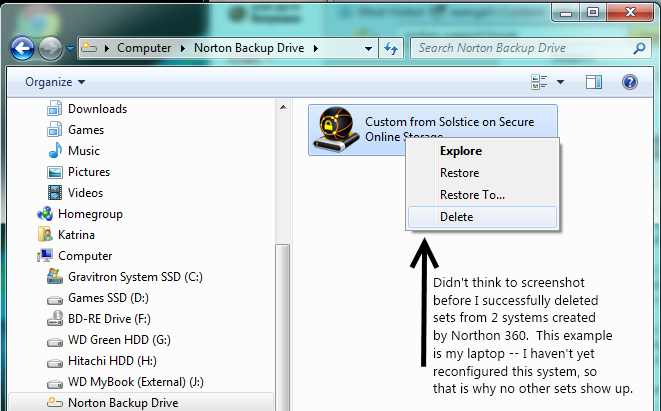 But I was even able to delete the backup data from a PC that never had Online Backup installed -- only Norton 360.